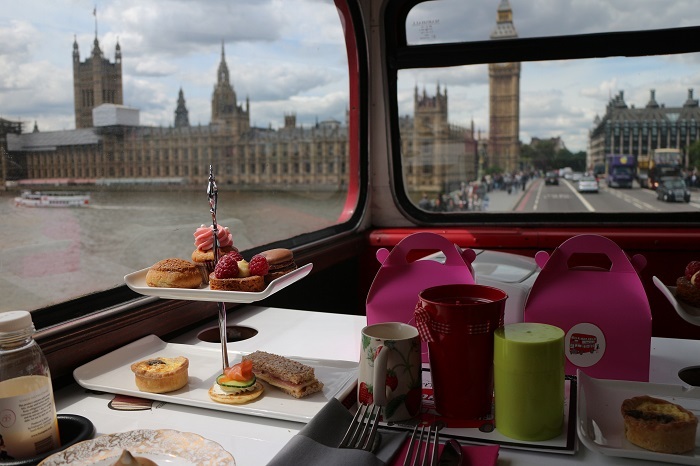 Two of my favourite things in the world are London and afternoon tea, so when the guys at Rennie asked me if I would like to join them on one of BB Bakery’s Afternoon Tea Bus Tours of the city I literally couldn’t say yes fast enough! 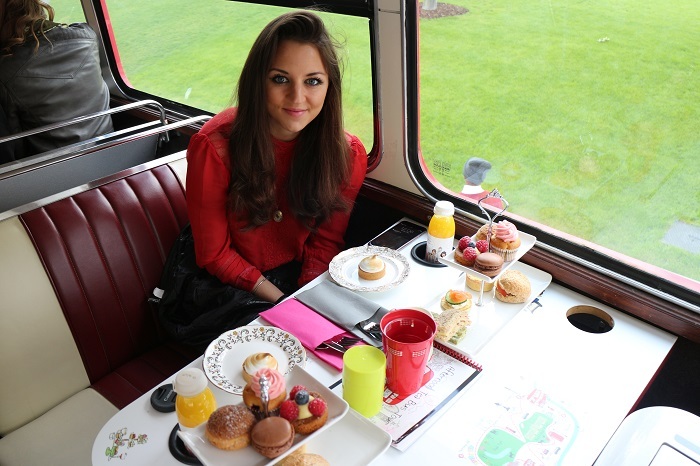 Since seeing the BB Bakery Bus Tour on last year’s X Factor I have always wanted to go, so me and my best friend headed over to embankment to join some other food loving bloggers on the trip. 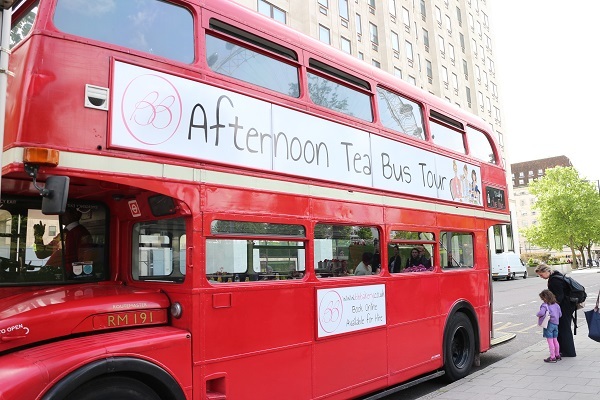 The very traditional looking red London bus has two floors laid out with really cute little booths decorated with a map of the tour route, where you are served the afternoon tea. All of the plates and stands are stuck down, so need to worry about food flying everywhere at any sharp turns! 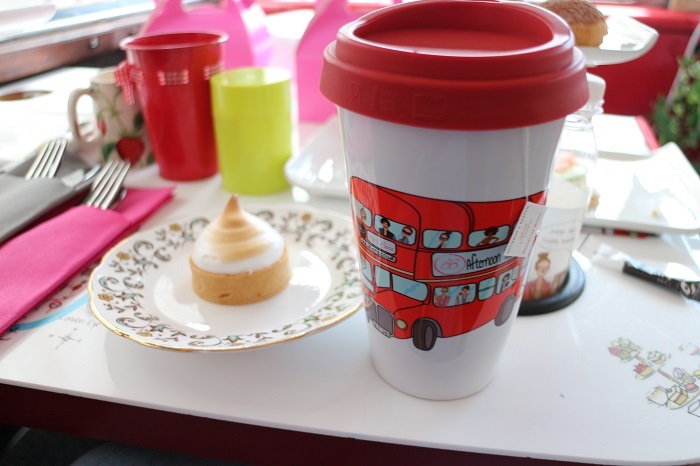 The tea was also served in a branded flask, which was a really nice little touch and if you wanted a souvenir of the tour you could buy one to take home with you. 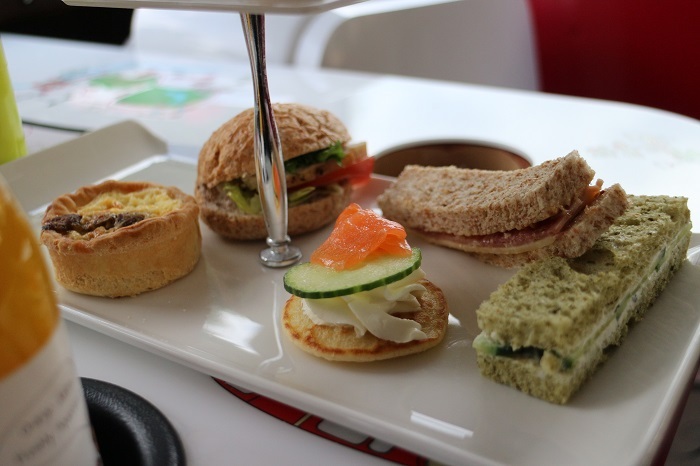 First up was a tasty selection of sandwiches including ham and mustard, cucumber and cream cheese and my personal favourite smoked salmon blini. Then it was time for cakes which was made up of a chocolate macaroon, a mini cupcake, a fruit and custard tart and a strange biscuity donut thing. 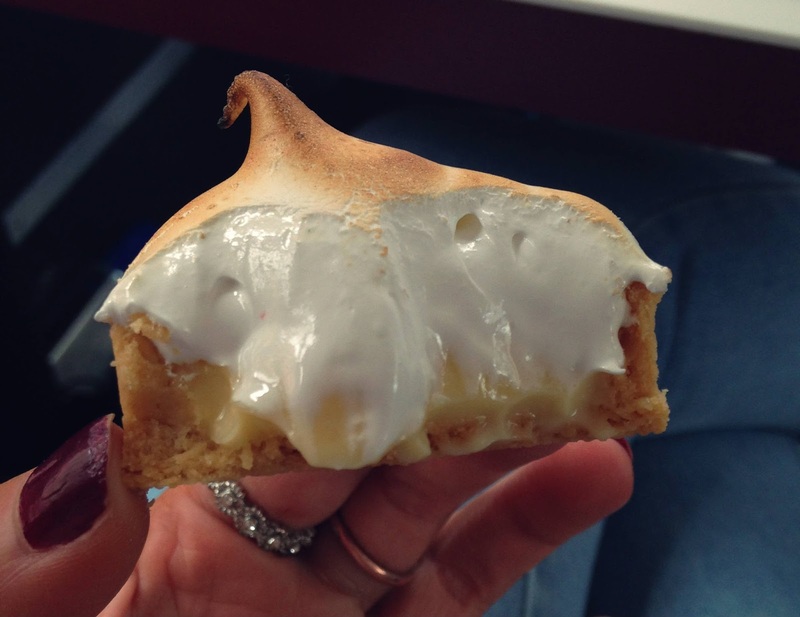 Served on a small plate in front of the stand was also hands down the most delicious lemon meringue I have ever tasted, fluffy and gooey it was perfection! 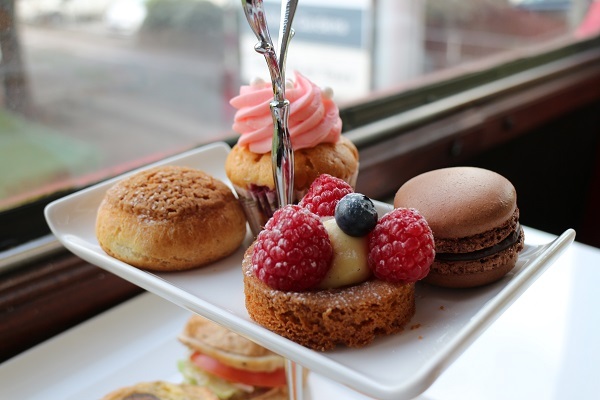 Now no afternoon tea would be complete without scones right? 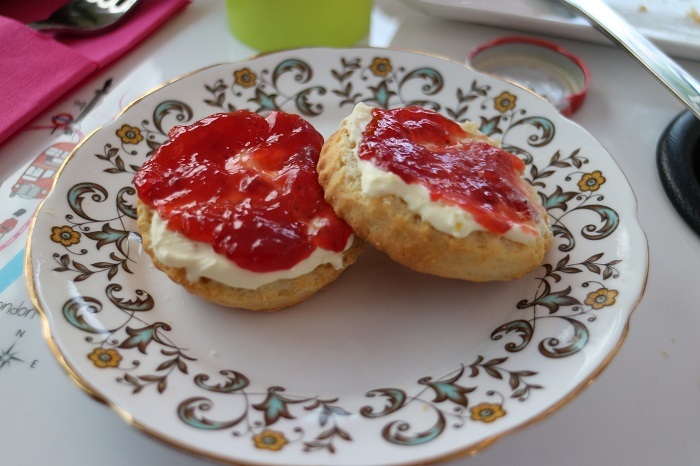 And these scones were served warm with a big helping of clotted cream and jam – delish. My only criticism of the tour was that it would have been nice to have the different attractions of London pointed out as you drove around. Some of them were quiet obvious like the Houses of Parliament, but for someone who may not be familiar with London it might be nice to point out a bit more clearly when you are driving past famous landmarks. Other than that, I was seriously impressed with the tour. 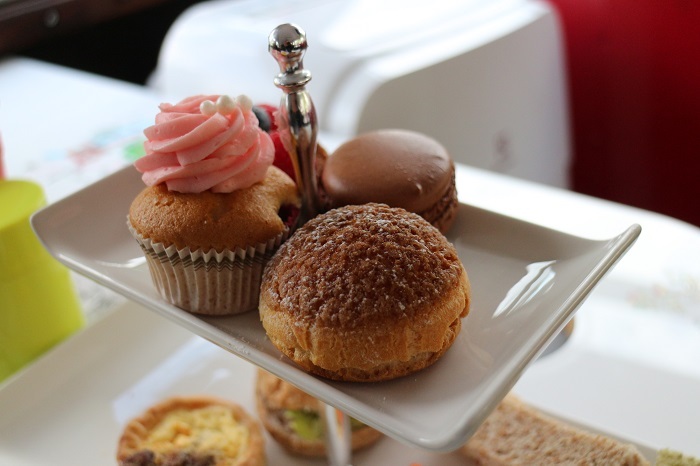 The Rennie team wanted to hold the event to show that eating can and should be fun, and that is definitely something that the BBakery tour shows. 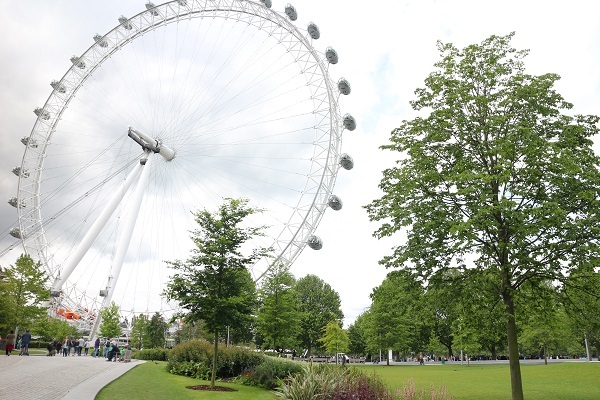 It is a really unique and quirky thing to do if you have an afternoon free in the capital. 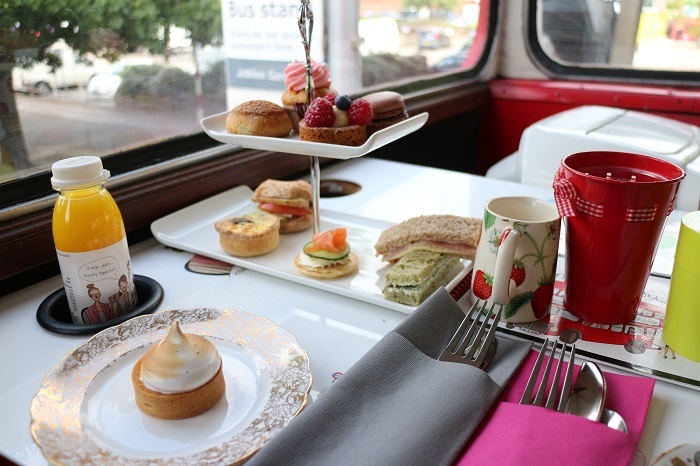 Have you ever had a quirky afternoon tea? What do you think of this one? Previous Post The Giveaway Post #2: Win a tray of sharing cocktails from The Botanist, Birmingham!